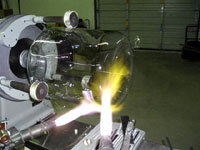 Atlas Glassworks, Inc. Product Information. Atlas Glassworks, Inc. creates and stocks many of the most commonly used laboratory glassware items as well as creating custom glassware according to your specifications. Impingers, Bubblers, Adapters, Filter By-pass Adapters, Filter Supports, Nozzles, Probe Liners and Manifolds. Distilling Apparatus, Cyanide Distillation Apparatus, Friedrich Condensers, Hempell Distillation Columns, Vigreaux Columns, Liquid and Vapor Dividing Heads, Reflux and High-capacity Condensers (Allihn) Distilling Collectors, Distilling Heads and Distilling Receivers. Custom Glassware: Turbo Vap Tubes. Separatory Funnels, Filter Funnels, Addition Funnels and Powder Funnels. Bubblers, Filter Funnels, Rotary Evaporators, and Sublimators. KD Flasks, Round and Flat Bottom Flasks, ERL Flasks and more.